**This is in no way meant to be preachy. I do not believe in proselytizing. It is mostly to help clarify something for myself, more than others. I was Baptized, Confirmed and married in the Anglican Catholic faith, all by my own choice. 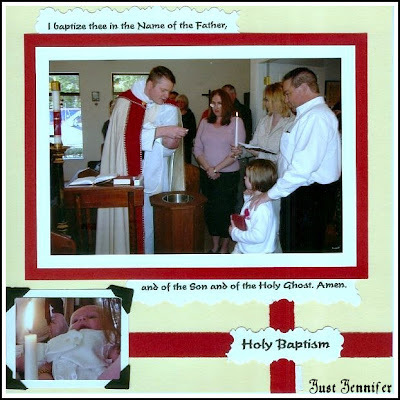 My children were both Baptized Anglo-Catholic. The other word for Anglican is Episcopal. Some lovingly refer to it as "Catholic Lite". It stems from The Church of England, the brain child of Henry VIII (yeah, the crazy divorcing and beheading king). However, the Anglo-Catholic faith in America today is quite far removed from the C of E, albeit still rooted there. The reason for the "Catholic Lite" moniker is that the rites, traditions, ceremonies, symbolism and basic theology are all very much Roman Catholic, with a few digressions. The two most important differences are that Anglicans do not follow the Pope or the Vatican (the Pope's refusal to grant King Henry an annulment from Katherine of Aragon is the reason he pulled away from Rome) and do not believe in the theory of Transubstantiation, that the bread and wine actually become the body and blood of Christ. Anglicans believe in a mystical "real presence", instead. Also, Anglican clergy can marry. Enough of the theology lesson. I became acquainted with Anglicanism when I met Mark, who had chosen to be Confirmed and practice that faith. When we met I was thirsting for spiritual guidance and sustenance, so I explored and got to know it, and fell in love with the pomp and circumstance. I love the rich tradition, symbolism, "smells and bells" and yes, Christianity in general. I have been drawn to Christianity my whole life, without ever being taught to. We attended a church in The Anglican Provence of Christ the King for the 9 years we lived in the Bay Area. However, there is not a church in the same body near our home here in Washington, so going to church has fallen by the wayside, while our Faith has not. One of the disciplines I came to admire and respect is Lent. It is the 40 days leading up to the most important event of the Christian belief, the Resurrection of Christ, or Easter. Lent is meant to be a time of preparation for this blessed event, a time of discipline and sacrifice, for prayer, fasting and reflection. Because I believe in who Jesus Christ was, his purpose and what he went through, I feel Lent is kind of awesome. Most people complain about not eating meat on certain days, not going to so many social events, or that it's just plain somber and morbid. I completely disagree. I mean, if anything in the Christian year is somber or morbid it's Good Friday, Holy Saturday and Pentecost. I appreciate Lent because it's just one small thing I can do to express my faith in God. I am far from perfect! Heck, I don't even attend church anymore. But my faith is still strong, I still pray, I still BELIEVE. My ideas about how to practice faith, as well as what having faith means, have changed and evolved over time, but Lent is just what it is. It doesn't need to change or evolve. The sacrifice made by Jesus eons ago inspires me to make the small sacrifices Lent calls for. It's the least I can do. So yeah, I'll give up meat on Wednesdays and Fridays, I'll pray more and try to quietly sit and be more reflective. I often also choose something else to give up for the duration. My biggest vices are coffee, wine and desserts. And I've given each one up in years past. I think this year it will be desserts. But thank the good Lord I get Sundays off! Because God is often something people are afraid to talk about. Just think of how yummy, tasty, amazing all those desserts at the Easter dinner are going to taste after going without for sooooooooo long! Yummy . . . now I am totally craving something warm and chocolate. Off on the hunt I go. I know it's not easy to attend a church near by where you live, now, but don't you think exposing your children to church while young would be a good thing? That way they can make their own choices later in life based on experiences. I never went to church *much* when young and thusly, you never went to church, and I am totally devoid of any connection to any religion *not to say I'm not extremely spiritual and have read the Bible, along with other spiritual texts*. But maybe your kids are missing out. Perhaps take them to different faith churches over the next few years? I didn't go to church as a kid yet I sought it out and found it as an adult. The kids know what we believe and sometimes we pray with them. We're always open to any questions they have. But I also feel that physically GOING to church isn't what it's all about. Really enjoyed this post. I did not grow up going to church. My mom is Catholic, my dad Episcopalian. I am neither. In fact, I don't really claim one faith practices over another, but if I had to choose I'd probably say Baptist. Mainly though, I think of myself as Christian. A few years ago I decided to observe Lent for the same reasons you said. If Jesus could make such a huge sacrifice for us, surely I could make a smaller one. I gave up bread - I love bread! It was a pretty big sacrifice for me. I felt it brought me closer to the Lord. There were times I really really wanted bread and had to pray for the strength to resist. A few times people said to me, "Oh, I didn't know you were Catholic." "I'm not," I'd say and I could literally see their brains exploding. I'm such a good friend, I'm willing to eat your dessert for you. Yup, no need to thank me. Funny I wrote about Lent today too! I usually give up ice cream, but this year I'm giving up time on the computer (FB, twitter, etc...) when my kids are actually awake! I think you might be a stronger woman than I! Last year I gave up Cadbury Eggs for Lent. Stupid? Yes. Difficult. Extremely. 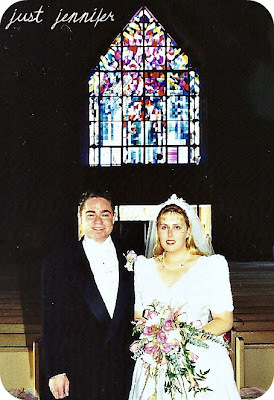 My hubs is Catholic and I am "without a religion" although I pray, read the bible and talk about Gpd to my children. They will be baptistized even though I never was. Hey, whatever is a sacrifice for you is all that matters. Thanks for commenting, Kristi! I'm glad to have found this post. I'm currently studying the Catholic faith and preparing to convert. I've never really "fit in" anywhere with my protestant faith, and Catholicism has always appealed to me. The beliefs are more in line with the things I've always believed personally, and the ritual and organization appeal to me in a way that's very difficult to explain. Thanks so much for sharing this! I'm glad you found it too, and glad you liked it! I think it's great that you are really thinking about why you observe Lent. Means so much more than when someone just goes through the motions. You are so nice to come home from Blissdom and read and comment!